The Secret of Hutton Church of England Grammar School: Special, not made in 5 days, Edition! Featuring new and improved graphics, animation, music and a lot of fixes! 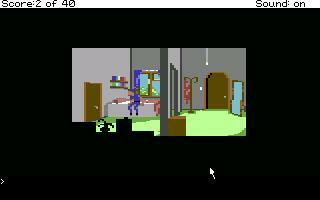 "Secret of Hutton is a delightful little throwback to the AGI days, with appropriate music and some nice animations. The main problems begin and end with the parser, which is far too incomplete to keep most users from wasting valuable time trying different things to get the proper outcome, and this in turn makes the game longer than it would otherwise be (it's actually a fairly short game if you know what to do). That said, it's a fun trip back to when games had simpler design models but still offered an entertaining experience." 2. I like to see traditional pixelated games, but here the graphics were really extreme to the point that they became very distracting. 3. The points system didn't seem to be related to progression through the game. I "completed" the game, but had only 23/40 points. The points seemed to be awarded for some random useless actions such as sitting on the bench. 4. The response "I don't understand" is generated when you listen and there's nothing to hear, or when picking up an item that can't be picked up, but this isn't really the correct response. It was OK, but some puzzles was quite hard, especially the spiral one. I pass through that puzzle by random clicking on all possibilities. This is a short game with lovely AGI graphics and some nice humor. I was unimpressed by the parser: too many missing responses. Worth playing with a walkthrough.